A resurfacing overnight serum to diminish acne, fine lines and dullness. Drunk Elephant T.L.C. 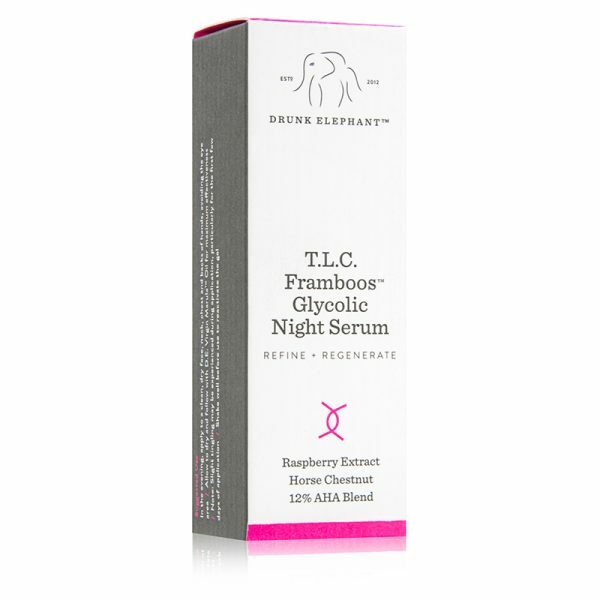 Framboos Glycolic Night Serum works to even your tone, dissolve dead skin cells and resurface your complexion while you sleep. Formulated with an AHA/BHA blend including Glycolic, Lactic, Tartaric, Citric and Salicylic acids and blended with raspberry extract, T.L.C. Framboos sinks in easily and delivers effective and precise chemical exfoliation without the harsh side effects like dryness or sensitization. Horse chestnut and white tea help to soothe. Fine lines, wrinkles, discoloration along with excess oiliness and pores will appear dramatically diminished. Apply a dime-sized amount to clean skin at night. Avoid direct contact with the eyes and eyelids. First-time users may experience a slight stinging sensation, which is normal. To avoid irritation, product should be used just once a day or once every other day for the first few weeks. After prolonged use (4–6 weeks), it can be applied twice per day. If redness, dryness, or irritation occurs, reduce frequency of application or discontinue use. This product contains a blend of Alpha Hydroxy Acids which may increase your skin’s sensitivity to the sun and the possibility of sunburn. Always apply a broad-spectrum sunscreen rated SPF 30 or greater every day. When outdoors, wear protective clothing whenever possible, seek shade, and avoid prolonged sun exposure. Water (Aqua), Glycolic Acid, Butylene Glycol, Glycerin, Sodium Hydroxide, Salicylic Acid, Lactic Acid, Citric Acid, Vitis Vinifera (Grape) Juice Extract, Aloe Barbadensis Leaf Juice, Opuntia Ficus-Indica (Cactus) Extract, Aesculus Hippocastanum (Horse Chestnut) Seed Extract, Camellia Sinensis (Green Tea) Leaf Extract, Rubus Idaeus (Raspberry) Fruit Extract, Saccharomyces Cerevisiae (Yeast) Extract, Buddleja Davidii Meristem Cell Culture, Sclerocarya Birrea (Marula) Seed Oil, Sodium Hyaluronate Crosspolymer, Allantoin, Hydroxyethylcellulose, Galactoarabinan, Propanediol, Disodium EDTA, Xanthan Gum, Hexylene Glycol, Phenoxyethanol, Caprylyl Glycol, Ethylhexylglycerin, Sodium Nitrate, Potassium Sorbate, Pentylene Glycol, Sodium Benzoate. PS: Results are evident from day 1!